The Brazilian Wandering Spider is one that is very interesting to learn about. They are in the record books as the Spider with the deadliest venom in the world. There are 8 known species of this particular Spider. The leg span of this particular Spider can be up to 6 inches. They can be about 2 inches in diameter around the abdomen. They have a body position that is very different. They lift the front two legs up so that they are able to sway from side to side. They are found all over the jungle floors and that is where their names come from. During the day though they hide under rocks and in crevices. Thy love places that are dark and moist. They live in the forests of Costa Rica, in Columbia, Peru, Brazil, and Paraguay. They are found all over these regions so it is very hard to count the number or them. They seem to do very well in places where humans have undisturbed items. This can be clothing they don’t wear often, piles of wood, items stored in the closet or the garage, and much more. This is why humans in areas where they are known to live have to be very careful. Sometimes they are found in crates of bananas and they are shipped all over the world. This is why many shipments have to be closely watched. People that unload them should be well aware of the fact that bananas are a common hiding place for this very venomous and dangerous type of Spider. 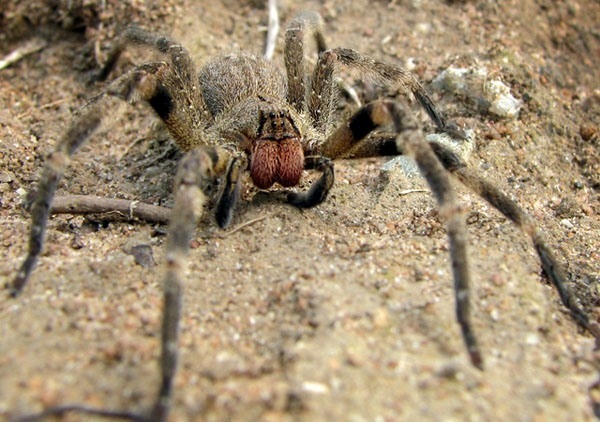 The Brazilian Wandering Spider is one of the most aggressive types of Spiders. They will fight each other over territory if there are too many in one area. They don’t seem to do well in captivity either due to the stress it causes them. They may stop eating in such a predicament. The males are also known to become very aggressive with each other during the mating season. They want to have every chance of being able to successfully mate with a given female. They may harm each other to get to her and keep another out of the way. Even though they are fairly large they stick to prey that is quite small. The struggle to be able to inject enough venom in larger prey to make them able to successfully kill it. However, it only going to take a small amount of it for the smaller sized prey. A female may turn away many males before she selects one that she will agree to mate with. Once mating is complete the male needs to run or the female will consume him. She controls when she will use the sperm from the male to fertilize her eggs. This can be right away or she can wait for a period of up to a year. She will then focus all her attention the eggs. She creates a sack for them make out of the silk her body produces. Being the most dangerous Spider of all isn’t something that many are fond of. This is why they are so afraid of this type of Spider. Many people trap and kill them because they don’t want to take a risk. PhTx3 is found in the venom of the Brazilian Wandering Spider. This is very dangerous for the body due to the loss of muscle control. It can result in a person becoming paralyzed. Breathing problems can occur as well due to the inflammation of the throat and the lungs. Once this venom mixes with serotonin there is going to be pain that is very severe in nature.